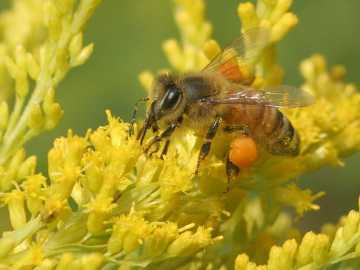 A honeybee gathers nectar from goldenrod in late summer. The orange clump on its hind leg is a packet of pollen, probably from milkweed. Honeybees forage up to 2 miles from the hive, collecting nectar in their stomach-like crops. As winter winds down, we huddle in our homes and make occasional forays outside to see if spring has arrived. Local honeybees are doing the same thing. Honeybees (Apis mellifera) spend the winter in their hives, keeping themselves warm and alive, until spring. In this way they are different from almost all other insects, which go dormant for the winter or die off when freezing temperatures hit, leaving eggs to hatch in the spring. Honeybees even differ from bumblebees (Bombus species). Only the bumblebee queen survives the winter, typically hibernating underground. Then in late winter, she begins laying eggs to build a new colony. In contrast, during winter honeybees cluster tightly together in the hive, with the queen at the center. In the cluster they generate and conserve heat. The colder it is, the tighter the cluster. They maintain a temperature of about 95 degrees F at the center of the cluster and about 55-60 degrees on the outside. The outer bees in the cluster shiver as their temperature drops, using their flight muscles to generate heat. The fuel their bodies burn to keep warm is honey. A typical hive needs about 60 pounds of honey for the winter. Over time, people have bred honeybees to produce much more than they need. On sunny winter days while snow is still on the ground, or on warm days when temperatures climb above freezing, some honeybees fly out to scout for food. If it isn't so cold that they freeze, these scouts report back to the hive either with nothing or with some of what they've found. These bees may also empty their bowels on these flights, leaving small yellow spots on the snow. The scouts' luck usually improves around the third week in March, when our red maples (Acer rubrum) and poplars and aspens (Populus species) usually bloom, with willows (Salix species) soon to follow. The scouts return from their forays with pollen, carrying it on their hind legs. We think of honeybees as feeding on sugary nectar and storing it as honey, but they also gather pollen. It is rich in protein and so is especially nutritious for their young. As the days lengthen in late winter, the honeybee queen begins to lay eggs. Her output increases as spring comes and pollen arrives in the hive. Honeybees are famous for their ways of communicating. When a foraging bee returns to the hive with nectar or pollen, it tells other bees where to find this food by doing a certain dance. In what's called the waggle dance, the dancer's path in relation to the sun shows other bees which way to fly. The speed of the dancer's wiggling tells them how far to go. Another dance, dubbed the round dance, tells of food that's nearby - within 55 yards of the hive. With luck, we'll get to see honeybees again this year, if they don't perish from the latest disorder that may be spreading among them. Honeybees are not aggressive – except when defending their hive – so you can usually enjoy watching them visiting flowers. If you see a honeybee south of Route 9 in Westborough, it probably came from hives at Nourse Farm or Harvey's Farm, which are supplied and maintained by Reseska Apiaries of Holliston. The honeybees are kept to pollinate crops, such as Nourse Farm's raspberries, blueberries, cucumbers, pumpkins, and winter squash, and to make locally-produced honey for sale. What about wild bees? "There aren't really any more wild honeybees," says Andy Reseska of Reseska Apiaries. In the 1990s, most wild populations succumbed to a virus that spread among honeybees in North America. It was carried by non-native mites that were introduced in the 1980s. Before then, wild honeybees nested in hollow trees in Westborough's woods. Now some wild populations are slowly recovering in warmer parts of the country. Medication and hive management practices give some protection to honeybees kept by commercial beekeepers and hobbyists, but recent news reports point to a new threat. Today beekeepers are worried about "colony collapsing disorder," which is causing honeybees to die off for reasons yet to be determined. Honeybees are the main pollinators of our crops and many flowering plants. They originated in Africa but came to North America from Europe, brought by early settlers. Honeybees around the world are all one species, but over time many variations or subspecies have developed. There are at least 29 subspecies. They can all interbreed. Honeybees are also famous for their caste system and their division of labor among three types of bees - the queen, drones, and workers of different ages. The queen is the only female in the hive that reproduces. Her main job is to lay eggs, up to 2,000 a day. As she lays eggs, she fertilizes them with sperm stored in her body from past flights outside the hive to mate. A queen lives about 3 years. In spring and summer, the hive includes a few male bees, or drones. Their role is to mate with a queen, if necessary. In the fall, when egg-laying is largely over, they are driven out and starve to death. Worker bees do most of the work of the hive. They are all female but cannot lay eggs, due partly to a chemical that the queen secretes. Workers live for months during the winter but only about 6 weeks in the summer, when they work themselves to death. They die after flying about 500 miles. As workers age, they rotate through many different roles. They start by cleaning the hive. Then they feed and tend developing young, build honeycomb cells of wax, guard the entrance, and store food. Their final role is gathering nectar, pollen, and water outside the hive. This social system is supported by honeybee genetics, as well as by their nutritional system. The males, or drones, develop from unfertilized eggs, so they have half the number of genes that the females have, and they pass all their genes to their offspring. The females - the queen and the workers - have a full set of genes. All workers are sisters. What makes one female a queen and all others workers? The difference depends on what the young are fed. Developing workers get a small portion of a special food known as "royal jelly", but the queen gets it for her entire life. Scientists finished sequencing the honeybee genome in 2006, opening the door to new studies of these unique insects.